The Save Our iMfolozi Wilderness (SOiW) campaign was launched on 1 May 2014. It is a project of the Global Environmental Trust (GET) opposed to Ibutho Coal’s application for an open cast mine that threatens the world famous iMfolozi wilderness area, a sanctuary for the greatest concentration of rhino in the world. The mine also threatens the livelihoods, health and well-being of neighbouring rural communities. The proposed mining area is sited on the boundary of the iMfolozi Wilderness Area, the first declared wilderness in Africa. 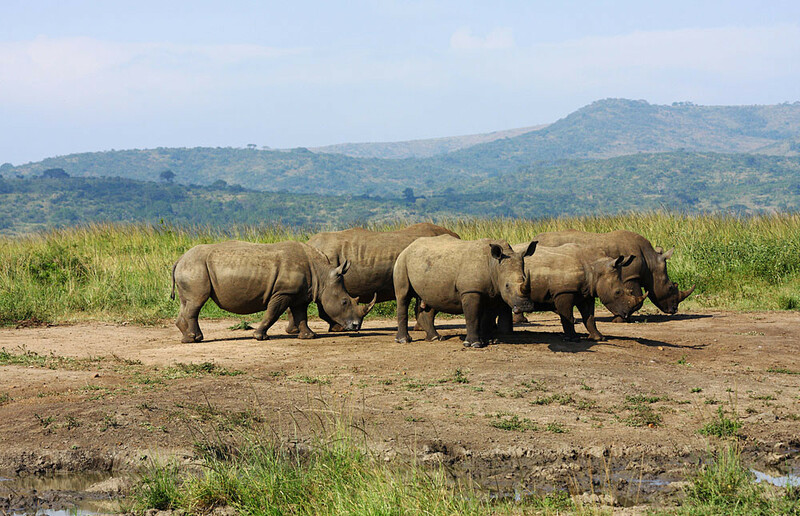 It lies within the oldest proclaimed nature reserve in Africa, the Hluhluwe-Imfolozi Park (HiP) home to a vast array of wildlife, including the Big Five. The Wilderness Area has a strong cultural heritage, dating back to the Stone Age. For the Zulu people, it is an important sacred site since before the time of King Shaka, who grew up in the area. HiP enjoys a reputation as a major tourist attraction and has drawn visitors from all over the world for more than 100 years. This unique wilderness area with such a rich history can never be replaced. South Africa has thousands of mines but only one sacred irreplaceable iMfolozi Wilderness Area. It is time to put soul above coal. Two coal mines already enclose the iMfolozi Park: Zululand Anthracite Colliery (ZAC) owned by Rio Tinto, and the Somkhele mine, operating as Tendele and owned by Petmin. With Ibutho Coal’s application for the Fuleni Anthracite Project , iMfolozi will literally be hemmed in by coal mining operations. Open-cast coal mining requires a substantial amount of water, and inevitably causes widespread air, noise and water pollution, resulting in irreparable environmental damage. Our legal strategy is to object all the way to the South African Constitutional Court. Our first victory was the rejection of the inadequate Scoping Report for the Fuleni mine in September 2014. We also felt vindicated when Ibutho Coal announced in November 2015 that it required more time to respond to the issues raised by Interested and Affected Parties (IAPs). GET’s lawyer, Kirsten Youens, submitted a definitive 72-page report of expert comment on the inadequate draft Environmental Impact Report (dEIR) We will continue these challenges at every opportunity. We strongly contest the rationale of exporting the coal to India and Spain, and possibly Germany, and leaving South Africa with serious environmental impacts and human rights issues that extend from the local communities all the way to the iSimangaliso Wetland Park, a World Heritage site on South Africa’s eastern coastline. We are working with the seven affected Fuleni villages to support their stand against the mine. 173,000 signatures collected by the Avaaz petition and the Care2 petition, indicate the extent of local and international opposition to the Fuleni mine. Despite this opposition, Ibutho Coal Ltd is pursuing its application at great expense. GET has the support of the local affected communities as it prepares itself to take legal action to safeguard a healthy sustainable environment and the historic iMfolozi wilderness, originally created as a sanctuary for rhinos. The launch of the Grrrowd campaign (now the Crowd Versus) on 17 November 2014 is crucial for our fight for environmental, economic and social justice. We need to show the SA government and Ibutho Coal that the iMfolozi Wilderness Area is sacrosanct and that there is overwhelming international opposition to proceeding with this mining application. The Save our iMfolozi Wilderness Declaration (see below) has been signed by Archbishop Desmond Tutu, Kingsley Holgate, Jane Goodall, amongst other celebrities. South Africa has no shortage of mines but a unique wilderness area with such a rich history can NEVER be replaced. HELP SAVE the iMfolozi Wilderness Area by saying NO to the Fuleni Coal Mine and YES to keeping Wilderness Areas sacrosanct. Please take a look at our blog page for the latest on this issue.